Everyone needs a Cheers pub in their life—a homey eating/drinking/socializing spot where the mood is alway right, the conversation easy, and the grub dependably nourishing. Ripple has been Cleveland Park foodies’ Cheers since opening it’s doors in May 2010. For Mr. Green Bean and I, Ripple is the casual night out for two, the restaurant to show-off to guests, and the nightcap detour (i.e. a glass of sparkling rose for moi and a plate of freshly baked cookies and milk for Mr. GB). The waitstaff at Ripple shares their own love for food with menu suggestions and descriptive explanations of complex concoctions. Executive Chef, Logan Cox, is committed to creating seasonally changing menus featuring local ingredients. The plates (organized by small, medium and large), snacks and sides, and cheese and charcuterie all offer plenty of noshing combinations, like a “choose your own adventure” in dining. The wine by the glass and bottle list is smart, offering numerous reasonably priced options carefully chosen by Bar Manager, Josh Berner. Ripple accommodates the gluten-free diner like a good friend who wants to make you feel comfortable at her dinner party. The many naturally gluten-free items on the menu prove that gluten is often superflous to fresh and flavorful dishes. Mr. Green Bean and I recently had the full Ripple dining experience with our good friend, Dr. Lobster. We constructed a delicious meal with lots to nibble, filling our small table with too many plates to fit! We started with a bottle of tasty wine, a selection of three cheeses, and hand cut fries with homemade apple ketchup (which I guiltlessly enjoyed after the waiter checked that nothing glutenous had shared the frier that evening). I cleaned the “composed seasonal vegetables” plate, garnished with dollops of goat yogurt and black cardamom puree. I can imagine now how Peter Rabbit felt tempted by all the delicious seasonal treats in Mr. McGregor’s farm! Poor disobedient bunny. For our next course Dr. Lobster and I both tried the “delicata squash soup” poured at the table over “Lynnhaven oysters, sorghum, shaved chestnuts, and sorrel”. Total sensational pleasure. Each spoonful was sweet and slightly creamy, accented by the mild sorrel flavor. Were it not for the plump oysters, like anchors in the rich broth, this could have been dessert. Mr. Green Bean ordered the “pan-roasted strip loin” accompanied by “crushed sunchokes, radish, nasturtium, and marrow emulsion”. Though slightly scared by the foreign objects, I am proud to say Mr. GB bravely conquered the dish. The strip loin was cooked perfectly and well balanced with the plate’s unusual accessories. Admittedly my fork gravitated after the waiter offered that the dish was gluten-free. 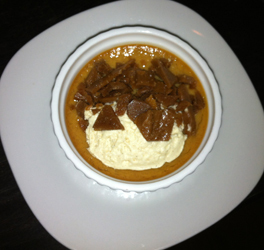 Although already stuffed, our waiter talked us into a gluten-free sinful indulgance on Pastry Chef Alison Reed’s dessert menu, “baked butterscoth pudding, with spiced cream, and toffee pieces”. If I thought the soup could have been dessert, this was dessert they feed you in heaven. The smooth pudding and crunchy candy bits distracted me enough to not even consider Mr. Green Bean’s favorite “baked-to-order chocolate chip cookies and milk”, without which no Ripple dining experience would be complete. Categories: 4 Spoons, American, Gluten-Free, Small Plates, Washington DC | Permalink. I am very impressed with Mr. Green Beans and his willingness to experiment with anything that is thrown his way. Clearly his parents taught him to be a good sport and a nice person. Would LOVE to try this place on a visit to you and Mr. GB!